Noradrenaline (NAd), which is one of catecholamine neurotransmitters, is related feelings of anxiety. Thus, its secretion volume intercorrelates with emotional psychosis. Lithium carbonate has been known as the earliest tranquilizer,[1, 2] and it is known that Li+ affects the secretion of NAd. However, the mechanism of that has not been elucidated yet. We are proposing one mechanism for it; Li+ may affect conformational distribution of NAd, which forms several conformations due to rotations around several single bonds. NAd transmits neural signals by binding to some specific receptors. This process is not only molecular-specific but also conformer-specific, i.e., some specific conformation of NAd can bind to the receptor. Thus, if a complex of NAd and Li+ (NAdLi+) forms different conformations from those of normal NAd (protonated under physiological condition; NAdH+), it should affect the molecular recognition process. In this work, we measured UV and IR spectra of NAdLi+ by using an electrospray cryogenic ion trap machine to reveal its conformation. Ions generated by electro spray ionization (ESI) source are mass-selected by quadrupole mass spectrometer (Q-MS) and are introduced to the cryogenic ion trap. The trapped ions are cooled down at utra cold temperature and their conformational fluctuations are frozen. Here a tunable UV laser is introduced and photo fragments due to the UV absorption of the ions are detected by a time-of-flight mass spectrometer (TOF-MS). Fig. 1 shows an experimental setup. NAdLi+ was produced by electro spraying methanol solution of NAd and LiCl. It was introduced into a cryogenic ion trap and cooled down at about 10 K. By cooling down to ultra cold temperature, the conformational fluctuations can be frozen, and different conformers can be distinguished as isomers by using double resonance laser spectroscopic techniques. A tunable UV laser was introduced to the cryogenic ion trap, and photo fragments generated by UV absorption of the stored ions were detected by a time-of-flight mass spectrometer. 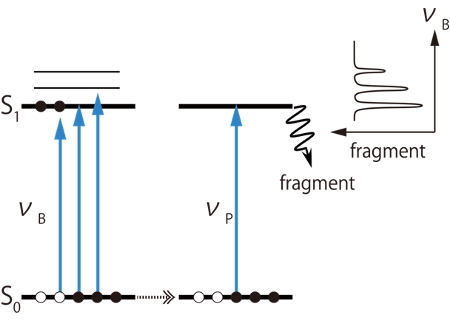 Since the photo fragments are observed only when the ions absorb the UV light, one can measure UV photo dissociation (UVPD) spectra, which corresponds to UV absorption spectra, by monitoring the amount of the photo fragments. Since electronic transitions of several conformers are observed simultaneously in one UVPD spectrum, UV-UV hole burning (HB) spectroscopy was employed to distinguish them (Fig. 2). In this method, two tunable UB lasers (nP and nB) are used. The wavelength of nP is fixed to a certain band observed in the UVPD spectrum, and amount of fragments due to nP is monitored. This fragment intensity is proportional to the population in the ground state of a certain conformer which gives the electronic transition probed by the nP. Then another UV laser, nB, is introduced and scanned. If nB excites the probed conformer, the population of the ground state decreases, and which causes decrease of fragment signal due to the nP. However, if nB excites other conformers, the intensity of the fragment signal does not change. Thus, the electronic transitions of only the probed conformer can be observed as decreases of the fragment signal. By replacing the UV laser with a tunable IR laser for nB, we can measure conformer-selected IR spectra, which is called IR dip spectroscopy. Fig. 3 shows UVPD spectrum of NAdLi+ with those of NAdH+  and NAdNa+ for comparison. In the spectra of NAdH+ and NAdNa+, long progressions are observed at 34000 ~ 34500 cm-1, while such a progression does not appear in NAdLi+. In the NAdH+, it was known that the long progression arises from a folded conformer, in which the amine chain is oriented toward the benzene ring. Thus this result strongly suggests that the folded conformer does not exist in the NAdLi+ complex. To confirm it, we measured UV-UV HB and IR dip spectra. 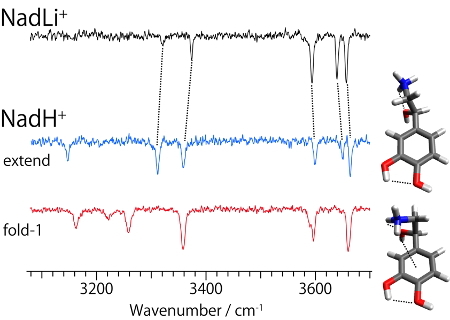 By applying the UV-UV HB spectroscopy to NAdLi+, it was found that 4 different conformers coexist (Fig. 4). 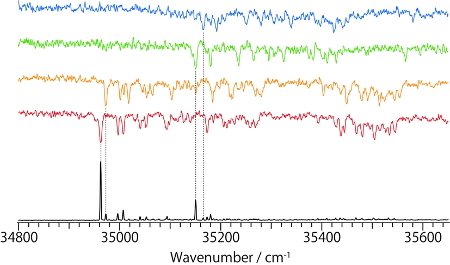 IR dip spectra of each conformer show almost the same spectral features, which suggests that they have the same conformation on the amine chain and different orientations of catechol OHs. 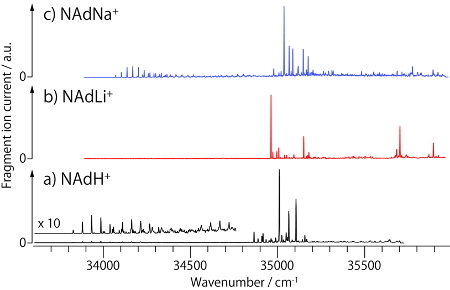 To determine the conformation of the amine chain, the IR dip spectra of NAdLi+ were compared with those of NAdH+ which has already been analyzed . In NAdH+, 3 fold-1 conformers, having different orientations of the catechol OHs, and 2 extend conformers were identified. By comparing the IR spectra of NAdLi+ and those of two types of conformers of NAdH+, it was found that the IR spectra of NAdLi+ can be assigned to the extended conformer. A band at ~3150 cm-1 is not observed in NAdLi+, which is quite natural because that band is assigned to a stretching vibration of NH+ and it disappears in NAdLi+ due to replacing H+ with Li+. We also conducted the same experiments for NAdNa+, and found that the NAdNa+ complex forms 2 fold-1 and 2 extend conformers. Therefore, the NAdLi+ complex, which forms only the extended conformation, is specific, and it was suggested that such specific conformational feature might affect the molecular recognition process of noradrenaline. J. F. Cade, Bull. World Health Organ. 78, 518 (1949). I. B. Pearson and F. A. Jenner, Nature 232, 532 (1971). H. K. Manji and R. H. Lenox, Biol. Psychiatry 48, 518 (2000). S. Ishiuchi, et al., J. Mol. Spectrosc. 332, 45 (2017). H. Wako, et al., Phys. Chem. Chem. Phys. (2017) in press. Copyright (C) 2019 Tokyo Institute of Technology. All rights reserved.